Tom Brooking with NY Sturgeon for Tomorrow and Dave White of New York Sea Grant with the 7-foot-long sturgeon that is joining the The Great Shipwrecks of NY’s ‘Great’ Lakes Signature Exhibit for the balance of the Great New York State Fair. Photo courtesy of Brian P. Whattam. Syracuse, NY, August 25, 2014 - The Great Shipwrecks of NY’s ‘Great’ Lakes Signature Exhibit presented by New York Sea Grant and The Great New York State Fair is adding new displays and expanding its in-water demonstrations. The exhibit is located in and along the reflecting pool at the mini-NY State Park at the Fairgrounds. Starting Monday, August 25, an historic fish that has been a passive behemoth in waters around the globe for more than 100 million years will join 300 years of shipwrecks history in The Great Shipwrecks exhibit. 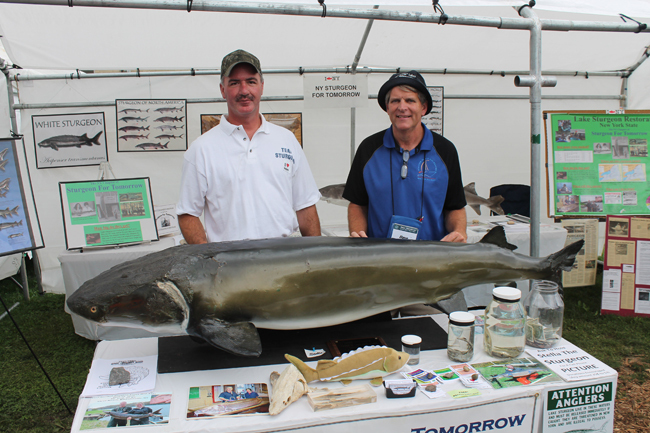 NY Sturgeon for Tomorrow will have its 7-foot-long mounted sturgeon in the Great Shipwrecks 60-foot-long tent for the balance of the Fair. Sturgeon take 15-20 years to reach full maturity and are the keystone species of freshwater sport fisheries around the world. They lived relatively unchanged for millions of year, but in the last 100 years many of the 27 species of sturgeon have become threatened or extinct. ‘Being part of this Great Shipwrecks at the State Fair is a wonderful opportunity to educate the public about New York State Department of Environmental Conservation efforts to re-establish the fish in such numbers that it can be removed from Threatened and Endangered Species lists,” says Cornell Fisheries Biologist Tom Brooking, a volunteer with the nonprofit NY Sturgeon for Tomorrow. A number of sunken items, including anchors, shipwreck artifacts, and a canoe are being ‘discovered’ in daily remotely-operated vehicle/ROV demonstrations daily at 2pm and 4pm in the reflecting pool at the Fair. On Wednesday, August 27, the Great Lakes Research Consortium and SUNY-ESF will expand the ROV demonstrations to 10am-4pm. People will be able to watch a 36-inch monitor as the equipment locates the underwater items throughout the day. Also on Wednesday, August 27, a SeaPerch ROV, developed in partnership with the Office of Naval Research, will be built on site at The Great Shipwrecks exhibit throughout the day and put into the pool for a test run. The inexpensive ROV kits are used by science, technology, engineering and math/STEM educators and robotics classes. “The SeaPerch is a great educational tool that students can build by following a curriculum emphasizing basic engineering and technology concepts related to underwater research and exploration, teamwork, and problem solving. We are thrilled to welcome Fair visitors to see how this ROV is built, and tested in the pool at the Fair,” said New York Sea Grant Coastal Recreation and Tourism Specialist Dave White, associate director of the Great Lakes Research Consortium, and coordinator of The Great Shipwrecks of NY’s ‘Great’ Lakes Signature Exhibit. The Great Shipwrecks of NY’s ‘Great’ Lakes Signature Exhibit features a replica French and Indian War-era bateau, videos and 10 interpretive panels detailing shipwrecks in Lake Ontario, Lake Erie, Lake Champlain, the Finger Lakes, Lake George and the St. Lawrence River, maritime artifacts from the H. Lee White Maritime Museum, three eras of scuba-equipped mannequins from National Aquatics Services, the 2014 Discover Clean and Safe Boating ‘mouse’ boat, Coastie, the talking safety boat mascot of the U.S. Coast Guard Auxiliary, and a 24/7 weather buoy in the reflecting pool transmitting Fair weather conditions to www.esf.edu/shipwreck. New York Sea Grant and the Great New York State Fair developed the Great Shipwrecks of NY’s Great Lakes Signature Exhibit in partnership with the Great Lakes Research Consortium, Lake Champlain Sea Grant, Lake Champlain Maritime Museum, H. Lee White Marine Museum, Great Lakes Seaway Trail, and U.S. Coast Guard Auxiliary, with funding through a Great Lakes Seaway Trail National Scenic Byway grant. Find more information at www.nyseagrant.org/shipwreck. For updates on Sea Grant activities: www.nyseagrant.org has RSS, Facebook, Twitter, and YouTube links. NYSG also offers a free e-list sign up via www.nyseagrant.org/coastlines for NY Coastlines, its flagship publication, which, in 2014, merges with the program's e-newsletter, Currents. NY Coastlines is published several times a year.